Open your holiday season with one of southern Utah’s biggest concerts when the Department of Music presents "Do You Hear What I Hear? 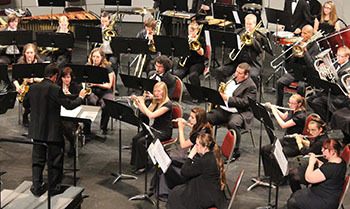 A Holiday Spectacular," which features festive musical selections performed by more than 100 SUU instrumental and vocal students from the Piano Ensemble, Symphony Orchestra, Wind Symphony, Concert Choir, Opus Choir and Women’s Choir. The concert's gala selection of music, ranging from holiday favorites to lesser known seasonal music worth hearing, has been chosen, prepared and directed by SUU faculty members Dr. Kevin L. Baker, Shannon Birch, Dr. Christian Bohnenstengel, Dr. Adam Lambert and Dr. Xun Sun. The program features such works as Nöel Regney and Gloria Shayne Baker’s “Do You What I Hear?” arranged by Harry Simeone, Michael Praetorius’ “Lo, Ho Rose E’er Blooming” and the French carol, Émile Blémont’s “Bring a Torch, Jeanette Isabella,” in an arrangement by Alice Parker and Robert Shaw, all performed by the Concert Choir. The Wind Symphony, Symphony Orchestra and Choirs join together for Randol Alan Bass’ glorious “Christmas Flourish,” a work that features a medley of traditional carols, and Leslie Bricusse and John Williams’ “Merry Christmas, Merry Christmas,” a joyous piece from the popular film "Home Alone 2." The voices of Opus Chamber Choir bring life to Gustaf Nordqvist’s “Wonderful Peace” and John Rutter’s “What Sweeter Music.” Members of the Piano Ensemble play “We Wish You a Jazzy Christmas” a spin on traditional works arranged by Catherine Rollin and Rollin’s “Celebration Overture.” The Women’s Choir is featured singing Allan Robert Parker’s “Sing Noel,” Christina Rossetti and Sherri Porterfield’s “Winter Carol” and Irving Berlin’s beloved “White Christmas” in an arrangement by Roy Ringwald. This holiday spectacular will be performed at Cedar City’s Heritage Center Theater on Thursday, December 4, at 7:30 p.m. Tickets are free for SUU students, faculty and staff with a valid I.D. card and just $10 for adults, $8 for SUU alumni with their Alumni Benefits Card, and $5 for youth.